Question: What do you do if you want a great latte without (a) a ton of hassle and (b) an exorbitant coffee shop price tag? Answer: Get a Nespresso machine. Pour milk into your frother and witness one-button frothing. Pop a capsule into your machine and enjoy one-button brewing. Save $4.00 or more every time compared to your local coffee shop. OK, you don’t need any more convincing. Let’s just jump to The Coffee Maven’s list of the best Nespresso capsules for lattes. While any OriginalLine capsule can be used for a latte, some are better than others. These are our 5 favorite OriginalLine Nespresso capsules for lattes. Ristretto capsules are the strongest, most intense OriginalLine capsules and are able to stand up to all of the milk used for a latte. Because of their strength, you’ll repeatedly see Ristretto capsules listed as the best Nespresso capsule for lattes if you ask this same question on forums or other message boards. A very close second to Ristretto capsules in terms of intensity, Arpeggio capsules are another popular choice because of their bold, roasted flavor. Whereas Ristretto capsules impart some lighter, fruity notes, Arpeggio capsules hit you with a subtle cocoa character that complements the smoothness of the frothed milk. These top two could be considered 1a and 1b. Comprised of 100% Indian coffee, Nespresso Indriya capsules are a consumer favorite. They have a strong spice note, which makes them perfect for any wintery holiday latte. Check out our list of 10 Great Gift Ideas for Coffee Lovers for some other holiday season treats! NOT Compatible with VERTUOLINE machines. 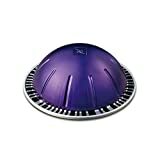 These capsules don’t appear in everyone’s ranking of the best Nespresso capsules for lattes, but they appear in mine. Disclosure: With an intensity level of only 4, they don’t stand up to loads of milk. But if you cut back on the milk a little bit, the balanced honey and malt character starts to come through with this 100% Brazilian roast. With high intensity and packed for a longer lungo pour, Nespresso Fortissio Lungo capsules have enough of a punch for any latte. The only reason they land at number 5 in this list is because their flavor is just a little more “plain ol’ coffee” than the others. But that may not be a problem for you, especially if you want either (a) a bigger latte, or (b) to use flavored syrups. 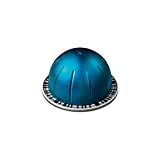 Nespresso OriginalLine: Fortissio Lungo, 50 Count - "NOT Compatible with Vertuoline"
Nespresso released their VertuoLine product line back in 2014, which was designed to take the capsule coffee experience to another level. You can read more about the differences between Nespresso OriginalLine and VertuoLine brewers in our guide. One big change is that VertuoLine machines aren’t limited to espresso and lungo shots; they can brew long coffees, too. Because there’s half as many VertuoLine capsules as OriginalLine capsules, it’s harder to build out a top 5 where every option is stellar. But we did it anyway! 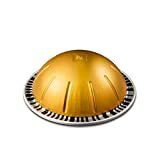 Second in intensity among VertuoLine capsules, Altissio is our vote for the best Nespresso VertuoLine capsule for lattes. As one of the 4 VertuoLine capsules in the “espresso” category, its robust, full-bodied profile shines through the frothed milk. For specialty beverages, Altissio capsules are head-and-shoulders above every other VertuoLine capsule. ROAST LEVEL: Dark roast espresso - Nespresso Intensity 9;Altissio is intensely and shortly roasted to reveal the full-bodied character of this bold blend. The only other intense VertuoLine espresso capsule Diavolitto checks in at number 2 because of its “oak, wood and leather” profile. I love its strength — this capsule won’t get lost of a sea of foamed latte milk — but those aren’t exactly my favorite flavors in a latte. The third capsule in the “espresso” category, Voltesso capsules drop significantly in terms of intensity. Instead, these capsules have a smooth, balanced sweetness that’s great for lighter lattes. The only flavored capsule in our top 10, Vanizio has a fantastic, subtle vanilla character that goes exceedingly well with any latte. The only downside is its lower-than-optimal intensity and the fact that it’s designed for long coffees (7.77 oz). Another capsule designed for 7.77 oz long coffees, Odacio has more intensity and a little bit of fruitiness, which makes it my favorite VertuoLine capsules for coffees. For lattes and other specialty beverages it falls a little in the rankings. These coffee capsules just aren’t designed for lattes like the espresso capsules ranked 1, 2 and 3. Save even more and experiment with whatever roast you want by purchasing a set of reusable capsules! Then you’ll be able to try one of our favorite whole bean dark roasts, which are perfect for specialty beverages. Note: Make sure you get the right reusable capsule set for your particular machine. 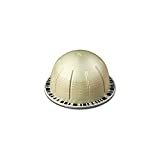 Below are our favorite reusable capsule sets for both OriginalLine and VertuoLine Nespresso machines. Safe to use, 100% BPA Free, made of food-grade material,Brew your own favorite coffee without any error code or modification needed. 2 SOLUTIONS: Foils and cap / filter with capsule / pod holder. Try them! DISCLAIMER: Nespresso and their logos are brands registered by Société des Produits Nestlé SA. Brand names and references of machine models are made solely with the aim of indicating our products compatibility. Our products and company are not associated in any way with the above companies. All of the capsule and pod machines tend to generate controversy. I can’t count the number of discussions I’ve read about how they’re bad for the environment. Nespresso also has a recycling program that you can join. Quick question. I’ve just brought a nespresso citiz and I can’t tell which capsule I’m supposed to use for a latte. 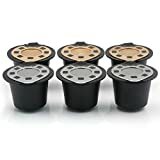 Do I use Lungo with Lungo capsules or an espresso capsule with espresso settings? I’ve tried using an espresso setting but it doesn’t seem to be strong enough, but neither does the lungo we have reset the machine back to factory settings, but I’m at a loss. Is it the capsules I’m using? 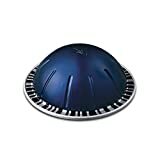 what is the least intense or most mile nespresso.